Report ITU-R BT.2408 highlights the need for the Unified Reference White Level which is suitable for both HDR systems (HLG & PQ) and provides examples of such values. Moreover, it stipulates that due to the distinctively large headrooms in HDR systems there should only be single Reference White Level, not two separate ones for Diffuse White and Computer Graphics. The dotted rounded rectangle in the central part of the diagram designates the “Target Device Agnostic Environment” within the HDR/SDR content workflow. Transcoding & Distribution, Insertion & Checking of Test Patterns. All such processes require normalized video data, ideally in the same format with the same white level, though mutually convertible formats with different, but known, white levels are also acceptable. A commonly accepted Reference White standard is needed for product verification, content production, post-production and distribution. It should be noted that such unification and normalization should not affect or restrict any creative intents of content originators, e.g. camera levels and gamma trims, color effects, associated metadata instructions, or display manufacturers efforts on enhanced HDR / SDR images rendition. Due to fundamentally different PQ and HLG approaches, very different transfer curves, etc. some experts express the opinion that it is nearly impossible to find common ground. We strongly disagree with this over-pessimistic opinion. Long Live Mutually Beneficial Peaceful Coexistence! Mixed HDR/SDR environments require software and hardware engines for verification, optional manual and/or automated enhancement, up-, down-, and cross- conversion within and/or between all HDR/SDR formats and color spaces. Recommendation ITU-R BT.2100 specifies the parameters of PQ and HLG transfer functions. It also specifies HLG Reference White Signal Level (RWSL) as 75% of the signal range. 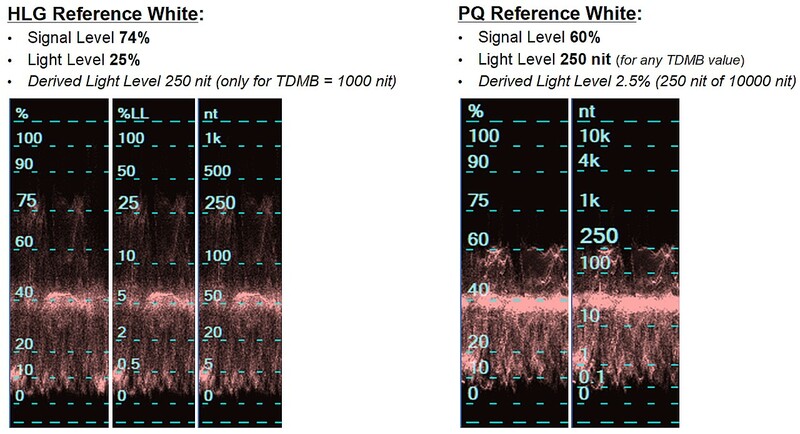 The Recommendation does not specify PQ Reference White, and it does not specify HLG Reference White Light Level (RWLL). A 75% HLG signal level translates to the relative light level of the ideal HLG display 0.2649626. By scaling this relative light level to absolute nits in case of widely used 1000 nit Target Display Maximum Brightness (TDMB) we get 265 nit. Signal Level 73%, commonly used for practical HLG cameras setup, is associated with 90% Reflectance Test Chart (Diffuse White Reference). Using this test chart camera Signal Level, estimated on a waveform monitor screen, is adjusted to about 73% – a bit below the 75% level (Computer Graphics Reference White). For 1000 nit HLG display 10% reduction of the relative Light Level translates to 0.9 x 265 = 238 nit value. However, it is highly undesirable to use two references. 25% HLG Relative Light Level (74% RGB Data Level). The HLG OETF Light Level 25% corresponds to the signal level of 74%, which is conveniently positioned between two widely used reference values of 75% (“CG White”) and 73% (“Diffuse White”), thus, this single level can be used for all cases. A 250 nit level is close to the middle point of the typical White Levels range currently used in PQ production; this range is reported to be about 145 .. 450 nit. A 250 nit level is also close to 300 nit, often quoted as a typical White Level of SDR content displayed by consumer grade HDR displays, and effective peak level of typical computer monitors and smartphones. The proposed HLG & PQ Reference White does not rely on any particular display type or display gamma. The 1000 nit TDMB value is used only for HLG levels scaling purposes, NOT as a target HLG device specification. This practical example shows why Unified Reference White is especially useful for live sport events coverage, when HLG and PQ versions are created simultaneously in real time. Maxim Levkov, principal engineer, Ellation, Inc. I think the document would benefit by picking normalized values for HLG (using an overall-system gamma of 1.2). This follows the practices established for conversion between HLG and PQ. The WFM signal percentage for HLG would then become 79.33%(265.51NITS) @ limited range. If this is the case, it leaves 20% signal level remaining for highlights (in HLG). With the reduced code values in the remaining 20% signal level, additional tests would have to be made to determine if there are any adverse effects in the highlight range and also what happens with conversion back to SDR.